Hating your administrator is so easy when they’re constantly telling you what to teach, when, and how. You’re a professional, for goodness sake! However, just like you heard Rachael and I talk on Episode #20 about this issue, principals are just people being told what to do too. And, although it may be really hard, we have to remember that they just want to come to work, do their job, and go home to their families like the rest of us. This mostly has to do with the conversations that you have with other teachers about the situation you’re currently in with your principal. When hashing over the unbelievable thing that they did or said over a bottle of wine with your teacher besties, remember to take time to ask for help or support. If all of the conversations that you’re having about your principal make your blood pressure rise, then you need to change the conversation to something more constructive. 2. Start asking for support from them early on. Don’t wait until the wall is built before trying to tear it down. Start conversations EARLY with your administrator in order to open up that line of communication with them and build a bridge instead. 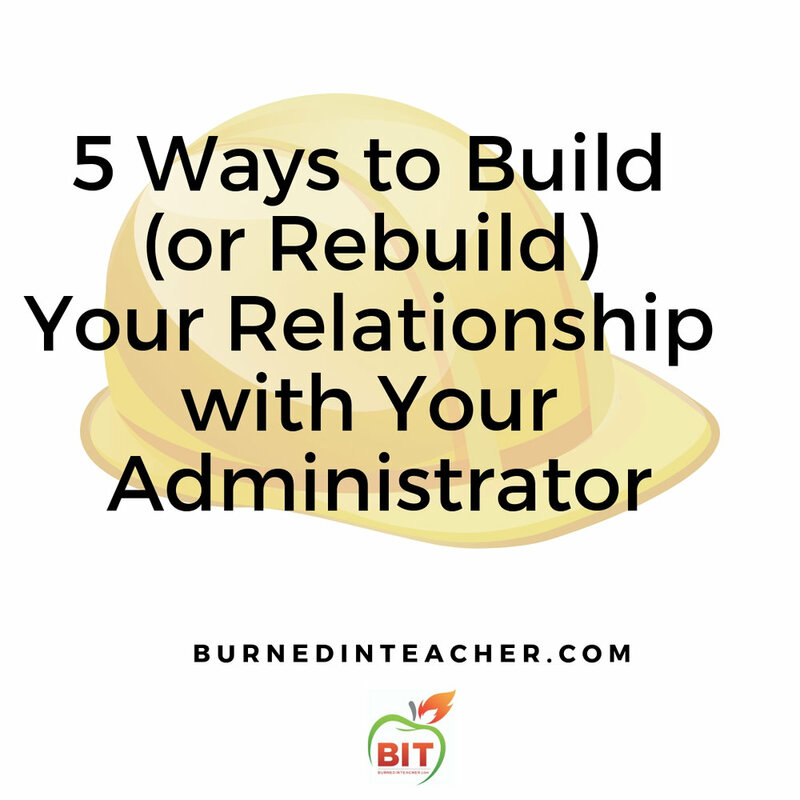 Communicating a struggle you’re having and approaching it from the place of vulnerability, rather than defense, is a great place to start in building or rebuilding your relationship with your admin. This is the hardest thing, especially if you have a history of taking meetings and school initiatives or rules personally. Have you, in the past, attacked your administrator with snide remarks or defensive questions in the middle of a staff meeting? If so, you’ve got to step back and get a little humble. You’ve not shown your administrator or your fellow teachers that you’re interested in seeking support and guidance from anyone. Schedule a meeting with your principal and tell him or her that you want to work on learning from them and ask for specific support with an issue you’re having in your classroom. Whether or not the advice is good or usable will depend on your situation, but at least you’ve let them know that you’re interested in listening to what they have to say. 4. Reflect on Your Locus of Control. This isn’t a new idea, but it sticks around because it’s a true staple in becoming mentally strong. Having the mindset that you’re going to do the best you can with what you’ve got, where you are, is a difficult habit to build if you’re in the business of complaining and defending yourself all the time. Take a deep breath and remember who you’re there for and what you can do within your control to be the best teacher you can realistically be. 5. Remember, they’re human, just like you. As the wife of a principal, I can tell you from experience: principals are just as human as the next person. They feel stress, frustration, and overwhelm just like the rest of us. They know that sometimes (as the messenger) they’re going to take the shot of blame for all of the changes that are constantly throwing you for a loop in the classroom. Try your best to be empathetic to the fact that they also make mistakes sometimes. If you feel you’ve misunderstood something or that they’ve made a mistake, make like a human and ask to sit down for some conversation about what you understood or misunderstood about something they’ve said or done. Chances are, you’ll build your bridge even stronger, because you had the humility to sit down and ask, instead of venting like the rest of the staff. Have You Considered The Burned-In Teacher Small Group Program? If you’re struggling with your relationship with your administrator and are looking for support, consider registering for The Burned-In Teacher Small Group Program. You’ll get eight weeks of intense support from me, Burned-In Teacher Mentors, and your fellow BIT Tribe members (even after the Small Group ends) + much more! Go to www.burnedinteacher.com/bitcoaching to learn more, read/watch testimonials, and to register for the upcoming Tribe! Check out A Sneak Peak into Janelle’s Journey Inside The Burned-In Teacher Small Group Program HERE.